This log cabin was built in 1974, on land that has been in my family for many generations and abuts the Green Mountain National Forest and Mt. Snow. The cabin is situated on over 50 acres of private property, most of which is undeveloped and has conservation easements. There are endless opportunities for exploring the woods. It is about 3/4 mile from Mt. Snow and on the MOO-VER shuttle bus line. We love our cabin, and it has many personal items, including original artwork and antiques, many books, comfortable-but-not-all-new furniture, and many games, puzzles and kids toys. This is not your typical rental cabin. This cabin is ideal for a family or for a quiet retreat by a single or couple, or two couples/families. Whether you enjoy hiking, skiing, star-gazing by an outdoor campfire, making meals together, sitting on the porch with a favorite novel, or curled up by the fireplace playing monopoly – this is the place for you. This house is also an ideal artist’s retreat, with six generations of family artwork sprinkled about. •	A Webber charcoal grill on the utility porch for BBQ’ing. The Rea Family Log Cabin is located on the mountain side Handle Road, on over 50 acres of private property, with conservation easements. Whatever the season, this is an ideal location for exploring the woods. There are old logging roads that can be explored, a brook behind the house, etc. There are no well-maintained trails behind the house – so bring your hiking boots or snow shoes! I find these woods very easy to hike in – even for young children. They are beautifully green and mossy and there are no hazards to speak of. It’s a wonderful place to find a special rock, or pick up a hiking stick, find newts, climb up a mountain brook, or build a fairy house in the moss. In the autumn, these woods light up with glorious colors – truly a sight to behold. In the winter, it’s a wonderful place to explore off-trail snowshoeing or cross-country skiing. The house will be clean and ready for you when you arrive, with clean sheets and towels laid out for you. Bath soap and shampoo are supplied. All paper products are supplied. There are extra blankets in every bedroom, and extra sheets and towels in marked bins and in the downstairs hall closet. There are emergency first aid supplies in the bathrooms. My parents built this home in 1974, on land that had been in the family for many generations. I enjoyed the house as a teenager and young adult - bringing friends up on ski weekends. Now I have my own family, and we spend summers and some winters here. I am happy to share this special place with you, and hope you enjoy all that our home and Mt. Snow and Southern Vermont has to offer. Our cabin is warm and cozy in the winter, and beautifully outdoorsy in the summer. This is a real family home that we would love to share with you. Real Vermont log cabin! Private woods to explore at all times of year. Excellent local caretaker, if needed. Upstairs bathroom has shower only, downstairs bathroom has bathtub/shower combo. Thermostat is located in the study. Never turn heat down below 55 degrees, as pipes may burst. Herbs and spices, oils and teas are usually available. Coffee is sometimes available in the freezer. Croquet, balls included -lots of outdoor space. Look in basement for toys. sleds in basement. One pair old style snowshoes in basement. i-phone/i-pod speakers Books, games, toys Located on 50+ acres of private woods with brook, for off-trail hiking, snow-shoing, or back-country skiing. NOTE: there is no TV. My family loved the cabin and enjoyed all the special touches that made it feel like a classic log home in Vermont. Everything was as described. Thank you for a wonderful weekend. The most cozy and authentic Vermont experience! We rented the Rae cabin with 2 other couples in their early-mid 30s and we absolutely loved our stay! It is exactly what we had in mind and is the quintessential rustic log cabin experience. Do not expect frills and luxury, this is a traditional log home built in the 70s. It was perfectly comfortable, charming and very convenient to the slopes/shopping. We loved the games, lincoln logs, wood burning fireplace, loft and vaulted ceilings. We will definitely recommend and look forward to staying here again when we ski Mt Snow. Charming woodsy cabin with lots of character! Absolutely loved our stay in Maria's log cabin. It is a cozy, authentic log cabin in a beautiful area. It was perfect for 3 couples looking for a quiet getaway. We enjoyed drinking wine in front of the fire place and skiing at Mt Snow (right down the road, so close!). The only thing we would have done differently is brought plastic cups / plates since there is no dishwasher, which can get challenging with a group. Other than that, we enjoyed a perfect stay and can't wait to come back next year! Great setting for a relaxing getaway. We loved our stay at this warm and inviting cabin. It's the quintessential, old fashioned Vermont cottage. The exposed logs and big fireplace were so nice to come home to after a day at Mount Snow, which is about two minutes down the street. This is a great place for a family getaway. We rented this cabin with 2 other couples for the second year in a row and loved it even more this time. We were greeted by the familiar and rustic sights and smells of property, which brought back great memories of our last visit. We spent most of our indoor time between the living room/roaring fireplace and the dining room, enjoying the peace and quite. I work in the tech industry, so 4 days without a laptop and tv were a welcome respite (although we did use the wifi to stream an NFL game!) We hiked at Mt Snow and explored the woods behind the cabin for hours, making fantastic new memories. There were some upgrades from our visit last year which made it even more comfortable. All 3 of us couples can't wait to return next fall and would recommend this cabin for any season! 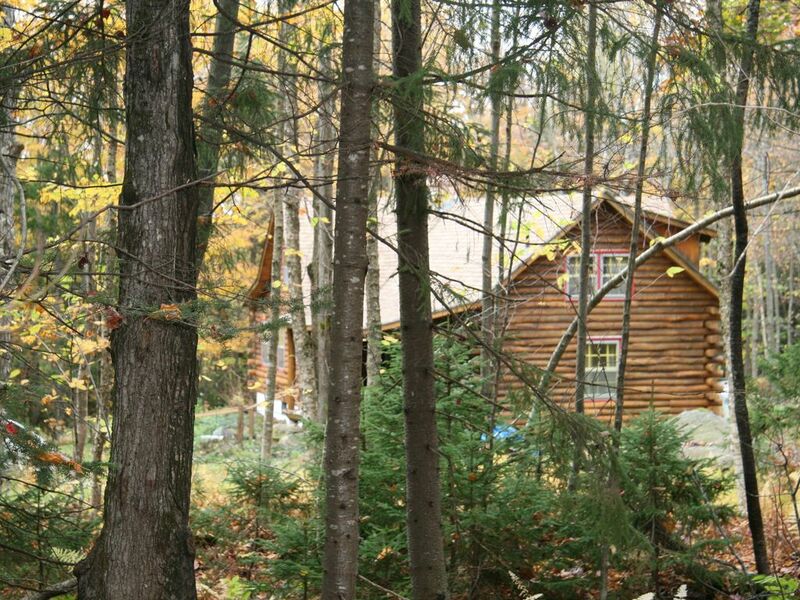 Our log cabin is located in West Dover, Vermont on Handle Road, just 3/4 miles to Mt Snow Ski resort. West Dover and Wilmington are in the Deefield Valley - a beautiful area vacation retreat with many options for recreation (skiing, hiking, biking, golfing, swimming, boating) and shopping, dining and local music. There is always plenty to do! Pick up the local Deerfield Valley News paper for all the current activities.